These Historic Properties have been restored and rehabbed to keep their historic charm and archtectural integrity while providing modern amenities in the St. Charles Main Street Historic District. The District is and are where you can walk to numerous amenities including restaurants, coffee, gym, parks, Katy Trail, government centers for City & County. More than 16,000 people work within a one-mile radius of this area. The buildings provide a mix of retail, office and residential spaces. We currently have office spaces available. If you are looking for space in the future, please contact us and we will contact you if suitable space becomes available. Since the late 1960's Main Street in St. Charles has won its way into the hearts and consciousness of the greater St. Louis area. There were a group of history conscious St. Charles people who worked to save these structures that witnessed the great sweep of settlement of the American West and the continual societal changes over the decades. When Lewis & Clark came through in 1803 some of these buildings were already here. The location of the first capital of Missouri in 1821 was on this street. Small businesses beginning with traders, explorers and fur trappers plied their businesses here. Interestingly many small businesses on the tech frontier also locate here now along with entrepreneurial small businesses of all kinds. Main Street in St. Charles is home to a community of enterpreneurs involved a broad variety of activiities including retail,, tech, food, beer, art, craft, music, yoga, entertainment, spas, service and great places to live within the best walking area in St. Charles County. 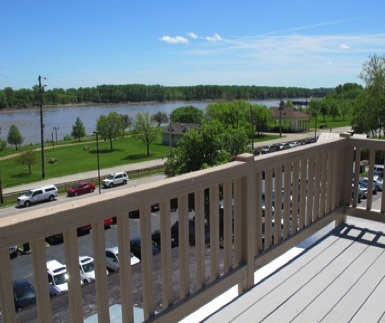 Includes a large rooftop deck overlooking Frontier Park and the river. 2nd floor office space 2600 sf plus a large deck overlooking Main Street.Several private offices, break room, conference room, etc. Each is available on a 3 or 5 year lease. View from rooftop deck overlooking Frontier Park.